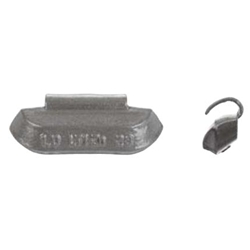 LT1Z Type Zinc Clip-on Coated Wheel Weight 1-1/2 oz BOWES WW LT1Z-015 BOX OF 25. The LT1Z-Series zinc clip-on wheel weight is used primarily on light-duty trucks, ¾ and 1-ton vehicles, with either tube or tubeless rims where such rims are too thick for standard passenger car weights. Also for use on heavier trucks with thin rim flanges. Please use rim gauge (RG2) to verify specific applications.